NIU STEM Educator Jeremy Benson exploring science concepts with students entering grades 5 and 6 during “It’s not magic, it’s STEM” summer camp. 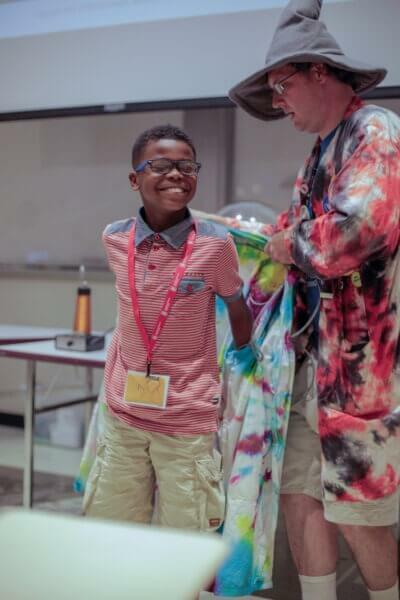 NIU STEM Educator and camp director Jeremy Benson has a gift for engaging students of all ages in the wonders of science, technology, engineering and math (STEM). 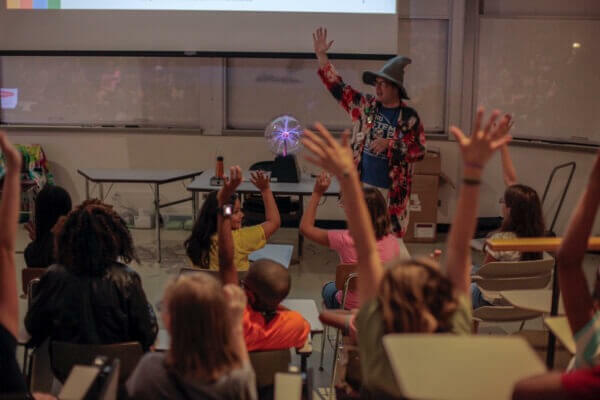 This year, he and his colleagues at NIU STEAM captured students’ imaginations with a summer camp based on everyone’s favorite school of witchcraft and wizardry. “It’s not magic, it’s STEM!” camp, designed for students entering grades 5 and 6, showed campers that when things look like magic, an exciting new scientific discovery is just waiting to be uncovered. The magic-school themed camp divided students into four houses that competed to earn points through lessons and extracurricular activities. Some of the students’ favorite activities included Potions (chemistry), Care of Magical Creatures (genetics and how animals get their traits), Transfiguration (using 3D printer filament and electronics to create motion reactive light-up LED wands), and Defense against the Dark Arts (critically evaluating information gathered from the internet using Carl Sagan’s “Boloney Detection Kit”). This camp was so successful that plans are already in the works to expand it for next summer. “The kids we had this year made me promise that I would design new second-year classes so that they can all come back again next year,” says Benson. “The magic of the camp was the enthusiasm of the instructors, counselors and campers,” says Sievert.